Wednesdays - 11 showings per year. Matinee: Doors open at 2pm for 2:30pm start. Evening: Doors open at 7pm for 7:30pm start. Membership Runs 1st May - 30th April. Adults - £20.00, Students / OAP's - £15.00, annually. On the Door: Day Member (adult)- £4.00 per film. See the What's On page for film details. Drimpton and Netherhay Youth Club (D&NYC) was formed in February 2009 after the village survey showed a need for a youth facility in the area. The Youth Club provides an evening of fun activity in a safe and caring environment for the children and young people of the Drimpton and local area. It is for children aged 7-15yrs, and is open to all. Children will be encouraged to stay on as Junior Leaders on their 16th birthday. We are committed to equal opportunities with regard to ethnic origin, religious beliefs, disability, gender and sexuality. We have dedicated youth leaders, all CRB checked and a first aider at every event. We are fully insured. The objectives of the group are charitable and for public benefit. Meetings are held on the 2nd Friday of the month from 6.30 to 8pm at Drimpton Village Hall. Activities include wii, table tennis, snooker, table football, air hockey, twister, etc along with team games and outdoor activities if weather permits. We also run a popular tuck shop selling snacks and drinks. As a treat, special event evenings and outings to bowling and local attractions are organised. If you need moreinformation see the village newsletter. Our home alley is at the Royal Oak. 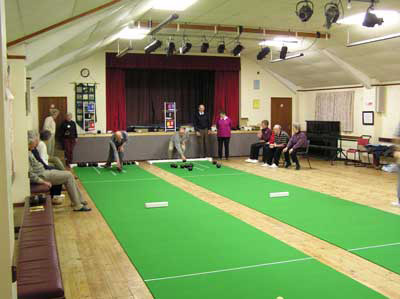 We play in the Beaminster and District Skittles League on Thursday evenings from September to Mid April. We play at home one week and away the next. New players are always welcome. No experience is necessary. Ask for a team member at the Royal Oak. We provide monthly Light Lunches at the Village Hall with a range of homemade soups on offer and everyone in the village is invited to come on the second Wednesday of the month at 12.30pm. During Advent and Lent we work with the two village churches to provide lunches. We also provide two grand annual Lunches – one in the summer and the other in the run-up to Christmas. These are always sell-out occasions. All profits are donated to a range of nominated charities. 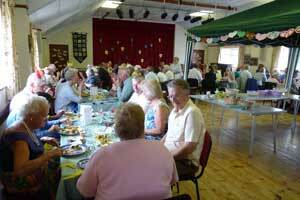 The Annual Summer Lunch always has a theme and everyone is invited to join in. 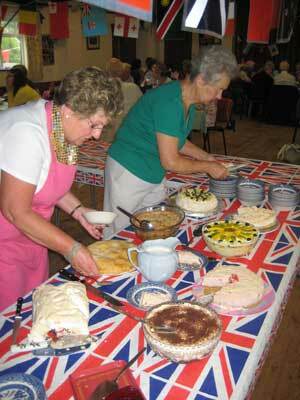 In 2012 the Jubilee was, naturally, celebrated in fine style with flags, bunting and 'coronation' fare! Two mats, woods of various sizes available. 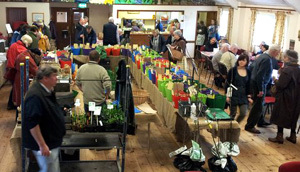 Welcome to the Garden Club, or to give it its proper title, the Clapton, Wayford, Drimpton and District Horticultural Society, which draws its membership from Drimpton and the villages around, meeting monthly in Drimpton Village Hall. No Dig Gardening; Making a Pond; Wildlife Garden; Container Planting; Cottage Gardens; Bees; Gardens and their role in Hospice care; Global Plant Trekking and the very popular Quiz and Puds. 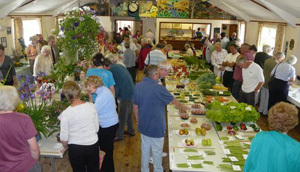 We also arrange a Potato Day each February, as well as the occasional outing and each August we host the Flower Show. We are a small friendly club, visitors and new members are welcome to any of the meetings. Each year we have asked our friends and members for their support in Sponsoring the prize money at the FLOWER SHOW. In the past your generosity has helped us to avoid a loss on the show. Will you support us again this year ? We suggest £1.50 per class (of your choice), and of course – as many classes as you like !! All sponsors are acknowledged at the class of their choice. Drimpton Football Club – Founded 1956.